There are over 1 billion websites on the Internet today. What does this mean for your brand? It means that you can’t afford to be mediocre. You can’t have an okay website or even just a decent one. It’s gotta be one that captures people’s attention and keeps them engaged. How can you do this? By writing insanely powerful website copy. Whether you’re creating a new site or tweaking one you’ve already got, check out these 13 tips for crafting epic text for your site. Need a website that sells and isn’t just a pretty face? Download our checklist on the copy elements to include on the 3 most important pages of your website: your home page, “about” page, and landing pages. How do you craft powerful website copy that people can’t resist? You learn everything you can about your ideal customer and write your copy specifically for this person. What matters to your ideal customer, what does he or she value, and what kind of language does this person use? When you know exactly who your ideal customer is, you can make it sound like you’re having a personal conversation with him or her. You can use the words and phrases this person would use, refer to the values he or she believes in, and incorporate the very type of humour he or she would appreciate. Brand websites can sound distant and impersonal. Yours doesn’t have to. When your customers are thinking of buying a product or service, many of them won’t go for the first thing they see. Instead, they’re going to shop around. How do you make your brand the frontrunner in the competition? Craft a killer value proposition and place it front and centre. Think of your value proposition as a conversation starter – you don’t have to include everything about your product or service in it. In fact, you shouldn’t. Instead, a value proposition is like an elevator speech for a website. It gives visitors key points about what your brand is about so they can decide if they want to stick around to explore. Website copy isn’t powerful website copy without it. When you write copy for your website, you have to focus on describing all of the features of your product or service, right? Wrong. If you want to write powerful website copy, focus on benefits instead of features. It may be hard to recognize this, but people don’t care about your products or services. (Okay, maybe your family and close friends do, but the average Joe Schmoe on the street doesn’t.) Instead, people want to know what your product or service can do for them. How can it help them solve a problem they have? Start by writing down all of the features of your product or service. Then, translate each feature into a benefit for your ideal customer. Remember that the best kinds of benefits are the ones that address major problems your ideal customer has. Just like people want to hear about how you can help them, they also want to know that you’re focused on them. 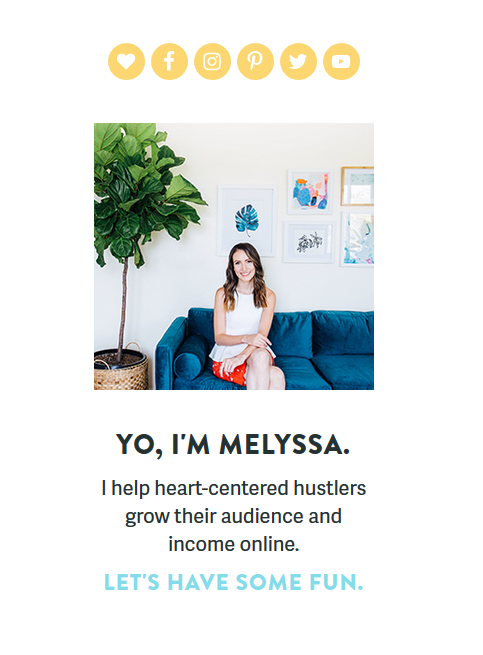 So to write powerful website copy, don’t focus on talking all about you and your brand. Instead, keep the conversation on your ideal customer. Depending on the product or service you sell, you might need to give your ideal customer details about what you offer. But remember, most people are going to read the beginning of a website page and not go any further. Other people might skim through without reading your copy from beginning to end. How do you make sure these readers get the info that’s most important for them to know? Write powerful website copy that conveys your most important points first. You can write powerful website copy that puts your most important points front and centre by using the inverted pyramid format. In this format, you provide your most important high-level points first. Once you give readers the most important info they need, you can move on to describing the details. Powerful website copy is simple and easy to read. You want visitors to explore your site and engage with your content. But there’s one thing you don’t want them to have to do: think. Your website copy doesn’t have to sound like a scientific article or an industry report. After all, who wants to read through dense sentences and paragraphs to find the info they’re looking for? Remember what we said before: powerful website copy makes it sound like you’re having a conversation with your ideal customer. So make your text casual and conversational. Of course, different degrees of casual and conversational writing are appropriate for different brands. If you’re a law firm or a cosmetic dentistry practice, you might not be comfortable using words like “yo” or playful language like “we never add anything weird to our smoothies.” But this doesn’t mean you can’t write powerful website copy that sounds more like a conversation than a lecture. You can’t have powerful website copy without killer headlines. Because most visitors won’t read your website pages from top to bottom, your headlines are super important. They’re the text people will read to decide whether they should spend more time on your site. So if you want to keep people engaged, you’ve got to hook them with a good headline. Need help crafting killer headlines? Check out these 3 free headline analyzer tools. A lot of brands have epic home pages. And why wouldn’t they? It’s the first page people are going to see when they land on the site, right? Well, not always. It’s true that your home page may be one of your most visited pages. But this doesn’t mean that everyone is going to enter your site through it. Someone searching for Hunter boots might first end up on one of your product pages. And someone who wants to read your latest blog post might enter your site on your blog page. Part of the process of writing powerful website copy is making sure visitors can figure out what you’re about no matter which page they land on. Many people will land on one of your pages and leave your site without exploring further. So you want to make sure people can figure out what you do and how you can help them even if they don’t end up on your home page. What’s the moral of the story with this tip? Don’t rely on your home page to make a solid impression. 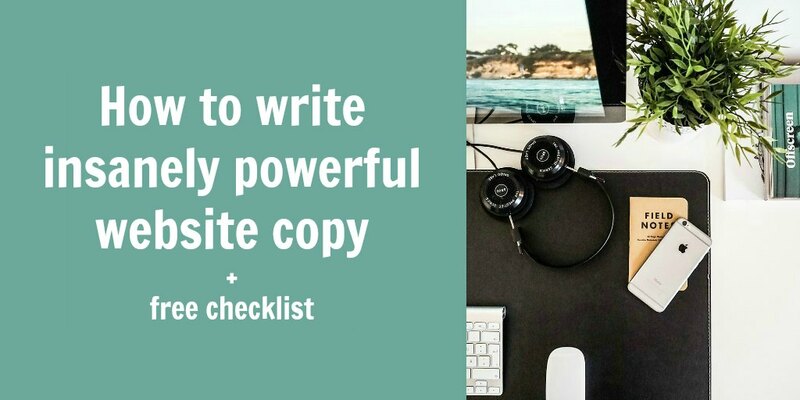 Write powerful website copy for every page to give people the info they’re looking for. To write powerful website copy, there’s something you have to come to terms with: most people are going to read only a fraction of your text. It doesn’t matter how good your copy is; most people are simply too busy to read most of it. So how do you write powerful website copy that will give you the best bang for your buck? Craft your copy for scanners. · Write short paragraphs: An 8-line paragraph may be okay for an essay, but that’s not what you’re writing. Limit most paragraphs in your website copy to just a few sentences each. Large chunks of text are hard to scan, but short ones are more manageable. · Use subheadings: If you need to write about several ideas or concepts, use subheadings. Subheadings serve as signals to visitors to tell them what each section of a page is about. For example, on a page about “shipping information,” an “international shipping” subheading helps international customers find info that’s relevant to them. · Use bullet points and numbered lists: If you have a list of benefits or features to describe, use a bullet-point or numbered list. Scanners may be able to pick up info formatted as a list, but they may miss it if it’s strung together in a single continuous sentence. · Use bold and italics: Just like we’ve done in this list, you can use bold and italics to make important words stand out. Of course, you don’t want to overdo it with this one – if you highlight everything, nothing will stand out at all. But if you do it right, using bold and italics can help scanners learn what they need to know. Okay, so this tip isn’t strictly about powerful website copy. But part of the process of writing powerful website copy is pairing your text with just the right visuals. Even if you’re a great writer, text can have only so much of an impact on its own. So if you want to make your website copy truly stand out, support it with stunning visuals. Place images beside or behind text to draw attention to it. And don’t forget about white space. It can do wonders for making copy stand out. No one wants to read website copy that sounds like a spammy robot. So always make writing for humans your primary goal. Those search engines are an important but secondary priority. It takes a lot of time to write powerful website copy. (At least it should if you’re doing it right.) So don’t make your investment go to waste by publishing website copy that’s riddled with mistakes or isn’t formatted properly. Instead, take the time to edit it. Remember that your website copy may be the first thing most people see about your brand. That’s why it’s worth it to put in the time to polish your copy and make sure it makes a solid impression on visitors. Need some strategies for editing your copy? Check out these 7 proofreading and editing tips. Writing powerful website copy isn’t easy. It takes time and practice to craft copy that truly engages and resonates with people. And you might not get it right the first time you do it. But lucky for you, websites aren’t hard copy books. You can tweak and update them any time. That’s why the strategies we’ve listed above aren’t meant to be tips you use once and never think about again. Instead, use them to iteratively refine your copy over time as your brand and your ideal customer grow and change.